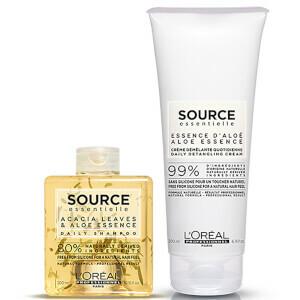 Treat your locks to the Source Essentielle Daily Duo from L'Oréal Professionnel. Combining a daily cleansing shampoo and a luxurious cream to banish knots and tangles, the kit will leave tresses feeling soft and manageable around the clock. A weightless formula that effectively cleanses and revitalises from root to tip. Fortified with Glycerin, Aloe Essence and dried Acacia Leaves, the luxurious shampoo expertly eliminates impurities and excess oil, whilst restoring softness and shine for a salon-worthy finish. Imparts a subtle scent of Peony and White Musk. Housed in a square bottle. 80% naturally derived ingredients. Infused with a host of beneficial ingredients, including Argan Oil and Aloe Essence, the 99% natural formula effectively detangles knots and improves manageability of hair for easier styling. The lightweight, non-greasy cream helps to minimise split ends and breakage to leave damaged hair looks soft, supple and full of vitality. 99% naturally derived ingredients. Cream: Apply evenly to shampooed, towel-dried hair. Leave for 1 minute. Comb through and detangle hair. Rinse thoroughly. Shampoo: Aqua / Water, Decyl Glucoside, Cocamidopropyl Betaine, Sodium Cocoyl Isethionate, Sodium Chloride, Glycerin, Sodium Benzoate, Sodium Hydroxide, Caprylyl Glycol, Citric Acid, Linalool, Hydrogenated Coconut Acid, Salicylic Acid, Gellan Gum, Sodium Isethionate, Aloe Barbadensis Leaf Juice Powder, Prosopis Juliflora Leaf, Limonene, Citronellol, Caramel, Dextrin, Spirulina Platensis Extract, Sodium Citrate, Sodium Phosphate, Parfum / Fragrance. (C219569/1).